Indianola, once the “Queen City of the West,” recovered from a killer hurricane in 1875 but it did not survive a second devastating storm in 1886. Modern day visitors find few remnants of the once prosperous Calhoun County seaport, but they’re looking in the wrong place. 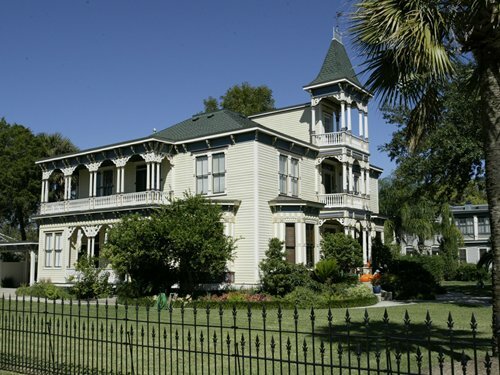 If you want to see some of Indianola’s stately Victorian houses, just go to Victoria or Cuero. Photo courtesy Gary Dunnam, Victoria Preservation, Inc. When people read of the death toll associated with the Aug. 19, 1886 hurricane (a wind-swept fire caused by an overturned kerosene lantern added to the destruction), they tend to think the double calamity virtually erased the city. Not so. Many well-built residences survived the storm and fire. But the people of Indianola had had enough. They abandoned the town, relocating the county seat to Port Lavaca. On Oct. 4, 1887, even the post office closed. Fine frame houses in the port city turned ghost town of Indianola could be purchased for $50 to $250. Since no one wanted to live there any longer, entrepreneurs had workmen take the houses apart piece by piece and shipped them via railroad to points elsewhere. Victoria has at least five ghost town houses. The Crain-Fox house, a two-story white frame house with red and blue trim at 1601 N. Bridge St.
A two-story house at 404 E. Goodwin was formerly owned by the A.M. McFaddin estate. The oldest of the Indianola survivors is the two-story Huck-Welder house on Convent, in Victoria’s once-elegant (and still nice) Diamond Hill neighborhood. H.J. Huck built it in the late 1850s. 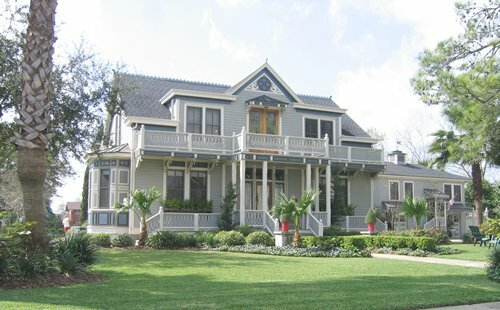 A German immigrant, he imported the lumber used to build much of ante bellum Texas, including the four-by-four-inch Florida cypress timbers he used in the construction of his house. After the 1886 hurricane, Huck’s son Francis had the house disassembled and moved by rail to a lot in Victoria. Jules Leffland, an architect who rose to prominence in Victoria, supervised the rebuilding of the house. A native of Denmark, then 30-year-old Leffland landed in Indianola in time for that city’s May Day celebration in 1886. Less than four months later, the hurricane struck. Leffland moved to Victoria, where he soon oversaw the rebuilding of several former Indianola houses. 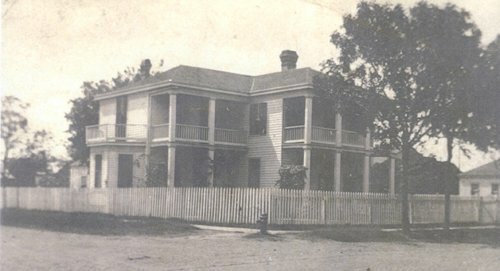 Huck and his family lived there until 1890, when he sold it to J.J. Welder. The Welder family held the house until 1942. When the house was restored in the late 1980s, a worker discovered a board bearing Leffland’s signature and date. 404 E. Goodwin in Victoria. Formerly owned by the A.M. McFaddin estate. 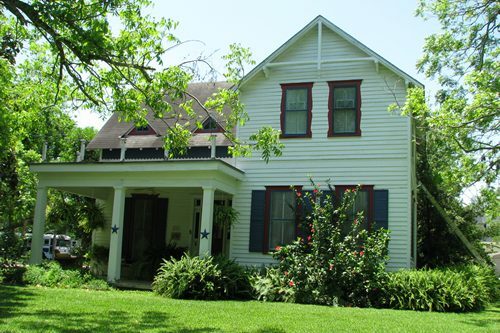 One notable Indianola house in Cuero is the Bates-Sheppard house at 312 Broadway, now home of the DeWitt County Historical Museum. As the 1886 Indianola hurricane raged, this house collapsed in the wind and tidal surge. Mrs. Sheppard (her first name seems to be lost in the various histories of the house) died when her house came apart as did a friend’s two sons and two out-of-town visitors. Henry Sheppard, Mrs. Sheppard’s 16-year-old son, floated away from the house clutching a piece of lumber. Seeing someone else in the water, he grabbed the person and later discovered it was his sister, Jennie. 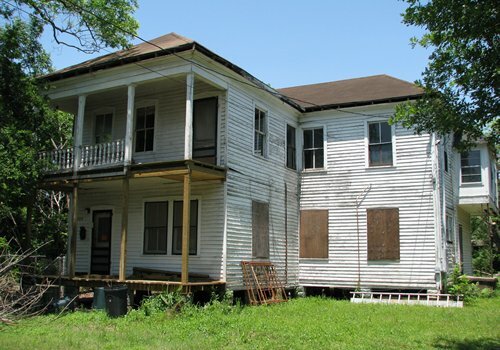 Later that fall, the surviving Sheppard family members returned to Indianola and had the remnants of their house shipped to Cuero, where they rebuilt it. Homestead Nursery, 7 miles south of Cuero on U.S. 183, is another structure that originally stood in Indianola. It went to Cuero first, where a man with the interesting name of Pius Fey operated a photographic studio in it. Then the one-story building got moved to its present location. At least one other remnant of old Indianola is quite fitting – a partial tombstone from the city’s hurricane-ravaged cemetery. It’s a pie-shaped piece of white marble broken by the force of the storm’s tidal surge. The portion with the name of the deceased is lost, but the surviving part notes the person’s birth year as 1834 and a death date of July 1 or 7, 1867 at Indianola. Now on display at the Nimitz Museum in Fredericksburg, the tombstone’s story is related in Doug and Fran Hubbard’s book, “That Dog Will Hunt! Growing up with the Admiral Nimitz Museum.” According to the book, someone from Fredericksburg overheard Hubbard saying the museum needed something representative of Indianola, where so many Germans landed in Texas. “Drop by our house and see what we are using for a door stop,” Bruce Deatherage said to Hubbard. Hubbard followed through and Deatherage ended up donating the piece to the museum. The book did not explain how the tombstone made it so far inland from the coast.